On the 23rd of September 2013, after (historically?) 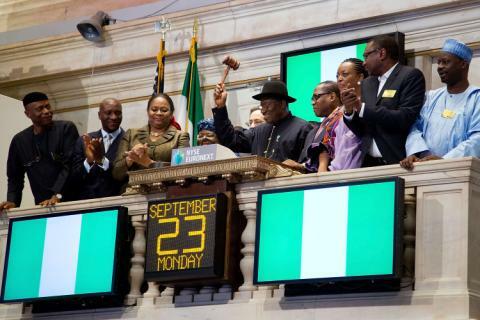 ringing the closing bell on the floor of the New York Stock Exchange (NYSE), President Goodluck Ebele Jonathan (GEJ), the President of the Federal Republic of Nigeria gave an interview to CNN which was aired on Quest Means Business hosted by Richard Quest. Below is my review of the interview. First let me say I don’t belong to the school of thought that thinks everything GEJ does is wrong. I also do not subscribe to the politics of acrimony and insults. I believe we can intelligently criticize political office-holders (even if we didn’t vote for them or are convinced they don’t deserve the office they occupy) without belligerently insulting them or belittling the office they occupy. There is the danger of political office-holders to live in “bubble-world” where they are totally cut off from the people they lead and the real consequences of their (in)actions. I hope somehow one the handlers of the President sees this. I perceive the visit to the floor of the NYSE must have been orchestrated by the President’s economic team with a view to project President’s desire for foreign direct investment (FDI). The President also fond a way to put that message across in the very first question he answered. Whether this will be effective in bringing about the desired FDI is another matter. The President as it is his custom (and that of his predecessors) was dressed in a traditional cultural attire. I wish Ms. Arunma Oteh (DG of Security and Exchange Commission) had also done that. This was the very first thing that jumped at me when the camera went live to the NYSE floor for the interview. The President was crowded in a “sea” of aides and officials . There was a bit a jostling and shoving amongst the officials for vantage camera position as well as between the interviewer and the Mrs Ngozi Okonjo-Iweala . All this added together not to project the Commander in Chief of the most populous black nation on earth giving an interview but more like a school excursion team. The setup did not in any way project confidence and power needed in the office of the Commander in Chief but more like a school excursion team being interviewed especially with the intermittent vigorous nodding by the entourage to answers by the President. I found myself unconsciously cringing throughout the interview expecting a major faux pas. Television perception is a very powerful tool. George H. W. Bush lost a debate and perhaps the Presidency of the United States of America to this power. The handlers of the President should please avoid this in future. Our president must “appear” presidential! One of the questions asked by the interviewer was about the problem of crude oil theft. I guess naturally Mrs Diezani Alison-Madueke, the Minister of Petroleum Resources may have one or two things she might have wanted to say about this, but to have been caught on camera whispering and muttering answers to the President was not flaterring to the person nor office of the President. Whether the President heard what she said or not, it added to the bad optics of the interview and didn’t project confidence. In my opinion, the President missed an opportunity to drive home a point I have heard him make before regarding crude oil theft. I have heard him assail and hold western countries partly responsible for the problem of crude oil theft being experienced by Nigeria. His point then was that this stolen oil is bought openly in the international market by western countries and hence they invariably encourage the criminal trade. The President could (and still can) start a crusade to make it difficult to sell stolen crude oil. If it is difficult to sell, it may make it less attractive to steal it. Rather than do this, the President sought to downplay the problem. The interview was “successfully” completed without any major faux pas. The obligatory “thank you” had been said by both parties. The interview ended with an handshake between the President and the interviewer. And to my dismay, the handshake was a failure. That may seem strange to some people. Handshakes can succeed and they can also fail. 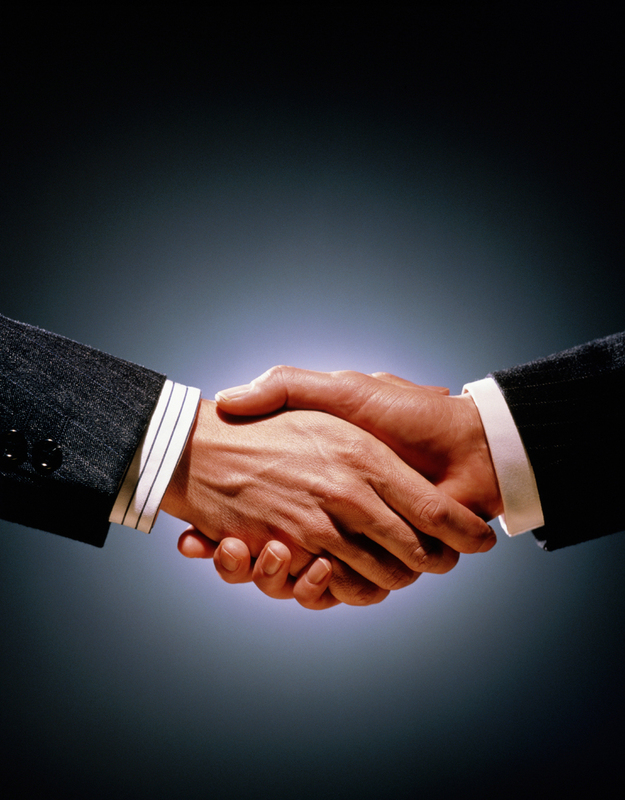 Handshakes represent an important component in the process of how we form our impressions our people and in turn what people perceive about us. The interviewer offered the President the tips of her fingers (and not her whole hand) which he proceeded to pump vigorously and for a bit longer that the lady wanted and she went on to almost wrestle her hand from his grip. I think the blame for failure of the handshake is not the President’s own to carry alone. It is for both parties involved to share. I am a student (and in turn a teacher) of body language and perception management. I think it is an important concept for everyone to know and be familiar with. I hope somehow this starts to feature in our general political space. Will be glad to hear you thoughts and feedback. 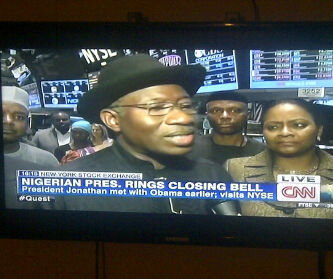 CNN : Absolutely, I am joined by President Goodluck Jonathan of Nigeria who has just rung the closing bell. Mr President thank you so much for joining CNN to talk to us today. CNN: Obviously, Mr President one quick question for you. Absolutely, all eyes are on Kenya right now with the deadly attacks in Nairobi by Al shabab. Nigeria is dealing with its on form of extremisim by Boko Haram. What are you doing to keep Nigerians safe and what impact does that instability have on Nigerian economy? GEJ: Thank you. I must first thank the organisers of the New York Stock Exchange for giving us the privilege to close the market today by the ringing of the bell. In terms of the issues you raised, we have always insist that terror attack anywhere in the globe is terror attack on all of us and that leaders must join hands to fight terror. In terms of Nigeria we have been doing all that it takes and we will continue to do what it takes to make sure we bring it under reasonable control or eliminate it completely. CNN: Another question for you Mr President. I know you earlier met President Obama today. One thing I found interesting is that Nigeria is Africa’s second biggest economy . One of every six Afican is in fact Nigerian. However, in the trips that President Obama have made to Africa he has not gone to Nigeria and a lot of Nigerians feel slighted by that. 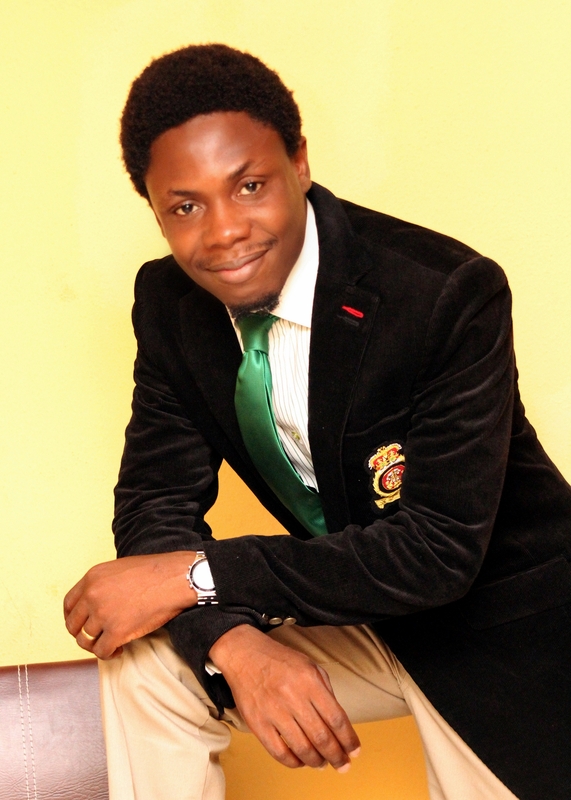 What are you doing to improve relationship between United States and Nigeria? GEJ : No No no there is no problem about the relationship between United States of America and Nigeria. Obama did not visit Nigeria because of any strain in terms of diplomatic relationship, not at all. But we will continue to engage America we will continue to discuss with America. Infact when I was an Acting President, I visited President Obama probably the first Acting President that was given audience to discuss with Mr. President by the American system so the relationship is quite robust. But the relationship between Nigeria and America is beyond the interest of America and Nigeria. Nigeria, at the level of West Africa and the level of Africa , is a major player just like America is number one in the world. Nigeria and America coming together will help the growth of the economy, peace and security not just for Nigeria and America but the rest of Africa so that relationship is very precious to both countries and the continent of Africa. CNN: Another question I have and which is on a lot of peoples mind is the issue of crude oil theft. At least 150 thousand barrels of oil a day gets stolen. How are you working with the international community to curb that problem? CNN: People say at least 150 thousand barrel of it. GEJ: It is much less than that . The area we suffer is the area of criminal vandalism of our pipelines and when that is done there is always shortage of production. So not all the time you have shortage that it is a result of crude oil theft. CNN: Mr. Jonathan thank you very much, take care.